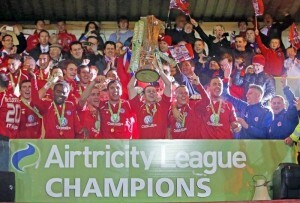 Sligo Rovers lifting the Airtricity League Cup earlier in the year. The Drogheda goalkeeper has been in superb form this season as the Boynesiders conceded only 36 goals in 30 games. The ex-Lazio man clearly made the right call in following his former Monaghan manager, Mick Cooke, to Hunky Dorys Park. The 25 year-old centre back has been a defensive rock for Bohemians and was rewarded with the fan’s Player of the Year award. The Dubliner has also been known to play as a striker and contributed eight league goals last term, making him Bohemians’ leading goal scorer. Ex-Bray Wanderers defender Prendergast proved to be one of the signings of the season as he formed an uncompromising defensive partnership alongside Alan McNally. 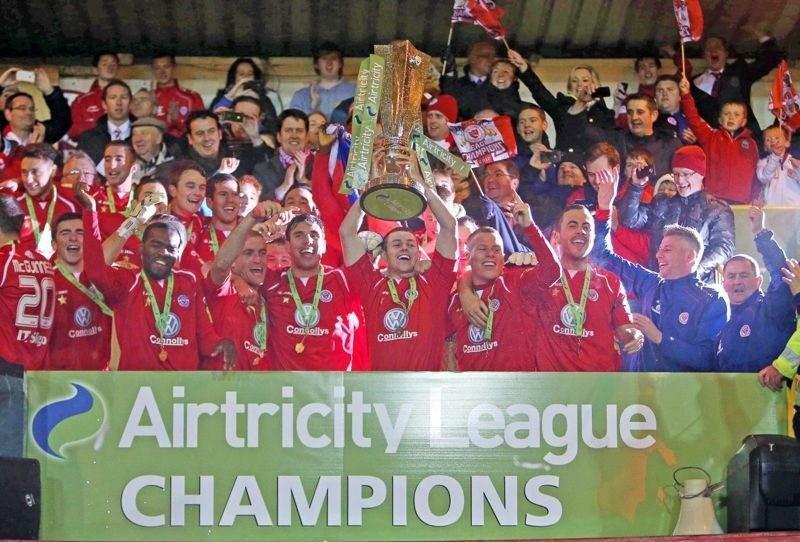 The centre back has signed on again for Drogheda next year, much to the relief of fans. Nominated for PFAI player of the year, McGuinness has produced his most consistent year of football to date. A last minute equaliser away to Shelbourne on the opening day of the season epitomised the defender’s importance to Sligo. He will be a big loss next year as he lines out for title rivals Shamrock Rovers. Just edging out Sligo’s Ross Gaynor, Bermingham was one of St. Pat’s most consistent performers under Liam Buckley. The Super Saints have fended off interest from Trevor Croly’s Shamrock Rovers to keep ‘Bermo’ for another season. A move from Bohemians for the youngster exceeded all expectations as he cemented his place on the right for Pat’s. Capable of the spectacular, like the lob against Shamrock Rovers, his reputation can only grow stronger as he gets more seasons to his name. Secured for 2013, the speedy right midfielder will now want medals around his neck. In a year where the Hoops’ defence couldn’t be trusted, Ronan Finn in the centre of midfield was definitely Mr. Reliable. Only behind Gary Twigg in his team’s scoring list, Finn can hold his head high with his overall contribution. With a fresh manager and squad members to work with, Finn will have every reason to keep striving towards the return of glory to Tallaght. The Cameroonian was a journeyman for most of his time in the League of Ireland, but now that he is settled in Sligo, he will be delighted to have won a league medal at the Showgrounds. Never afraid to add flair to his game, N’Do was nevertheless vital to creating the flow of goals for the Bit o’ Red without actually going for goal. Like Evan McMillan and Ronan Finn, McLaughlin proved that goals aren’t exclusive to the forwards. His efforts were all the more impressive as Derry City struggled with keeping players off their injury table. Ever since leaving Northwest rivals Finn Harps in 2010, he has won cups with the Candystripes and is on trial with npower Championship side Nottingham Forest. Gary Twigg’s pending transfer to Portadown will hurt the whole league, not just Shamrock Rovers. 22 goals for the season easily secured him the Golden Boot, and the clinical Scot showed his class all the way to his final games by shining against UCD and Sligo Rovers. North was desperately unlucky to have been curtailed for half the season, but 15 goals in 17 appearances is more than enough to put him in the 2012 Best XI. Mark Quigley failed to impress early on this season, so North’s ruthless efficiency in the box added extra significance to Sligo’s title victory.